Stop the Naval Base in Jeju Island, South Korea! Interview. Korean with English Subtitles. Check these Youtube channels for Jeju/Gangjeong related videos. Many videos are Korean only. Check these Vimeo channels for Jeju/Gangjeong related videos. Many videos are Korean only. The 1st passenger cruise to Gangjeong: What if it was your hometown? Why the 2nd Jeju airport project is suspected to be an air force base? Ending the 24 days’ fast to demand the halt of basic planning for the 2nd Jeju Airport. 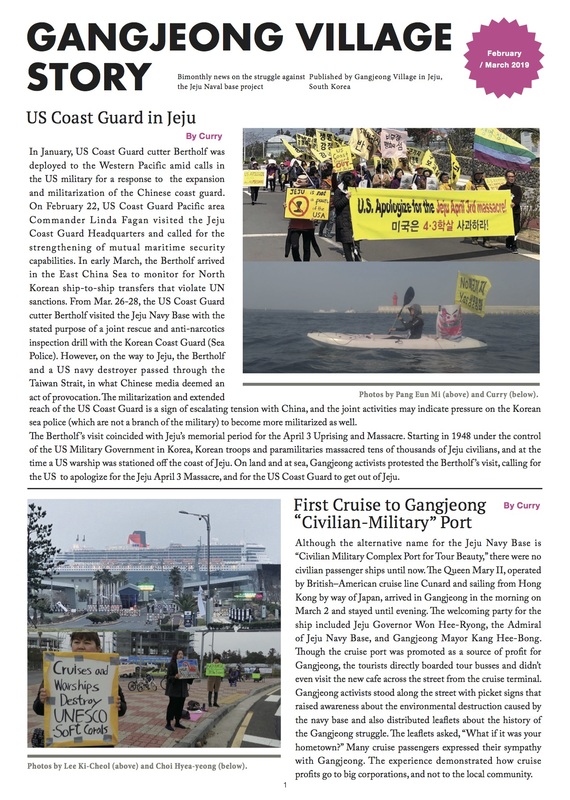 Gangjeong Village Story February/ March 2019 Issue In this February/ March 2019 Edition : US Coast Guard.. Copyright © 2019 Save Jeju Now - No War Base on the Island of Peace.